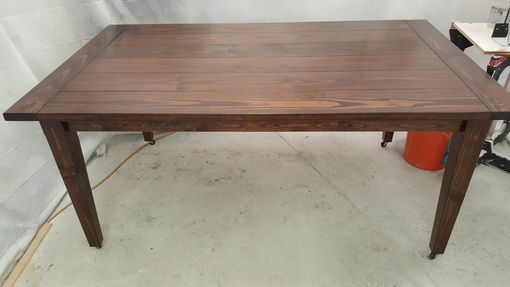 This is a nice example of a 42 x 72 dining table, using yellow pine, surface planed to 5/4". All boards are 7", biscuit and glued. The bread board ends are 5", oak doweled. 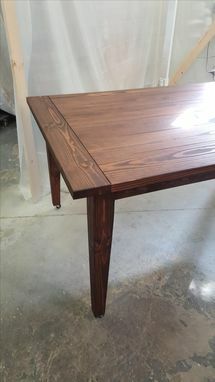 Pine legs are tapered and bolted to the table skirt. Each leg has a glide under foot. 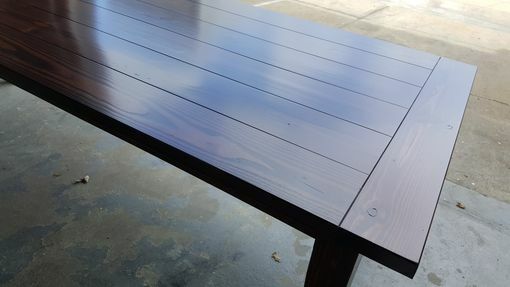 All edges on this table got treated with a chamfer, including between the boards on the top. The interior chamfers are reduced to make it a small groove in the finished top. 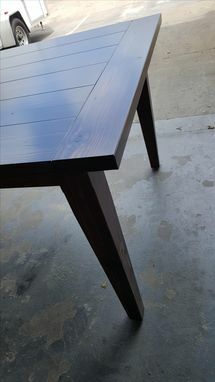 A penetrating stain is used, Red Mahogany in this example, and then 4 coats of EMTECH 9000 VOC water based urethane. With this I added Dark Walnut tint to the clear coat because the client wanted it less red and more brown. I can put an additive to the clear finish, and achieve a harder finish, more resistant to chemical cleaners and abrasions. 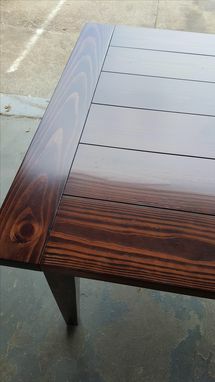 Used in commercial bar tops and tables. Typically unnecessary for home use. This semi-gloss finish has been cured for 3 days when the photos were taken. This table comfortably seats 6, and will seat 8 if needed. Everything I do is custom built for a client, unless otherwise stated. The client can pick up or pay for shipping. I would be happy to build one for you!